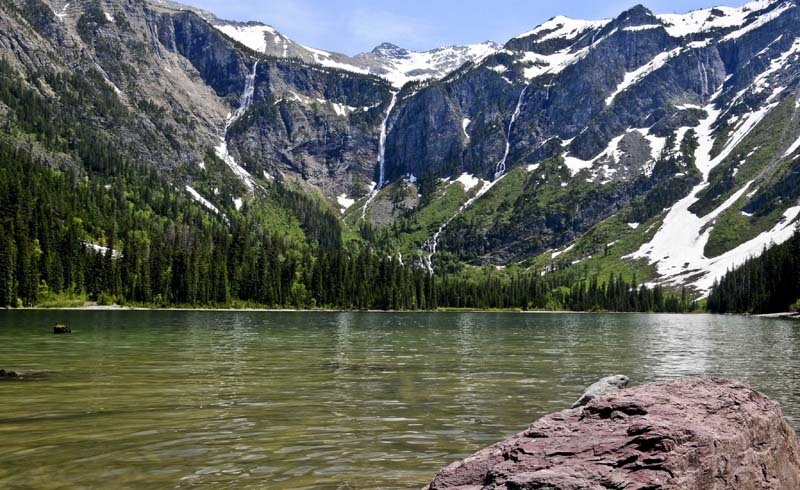 The best way to see Glacier National Park is by hiking into the backcountry. These six long-distance treks reveal the park’s incredible scenery while challenging even the most experienced hikers. Glacier National Park has earned a reputation as a hiker’s paradise, thanks to the solitude of many of its hiking trails, which meander miles and miles away from the nearest roads. Hikers also appreciate the beauty of the park’s natural features, which include numerous mountain peaks and some of the most accessible glaciers in the United States. While the average tourist may want to stick to short day hikes, adventurous hikers have plenty of options for longer treks into the Glacier backcountry. These six hikes will challenge the most experienced hikers and reward them with panoramic views of the park’s majestic landscape. A few tips: Each of these qualifies as a strenuous hike, so know your physical limits. Bring water, snacks, and bear spray, as Glacier is heavy grizzly territory, and come during summer or fall to avoid heavy snow. Take a backpack or large travel pack with you for your supplies, and consider using lightweight packing organizers to maximize your packing space without adding any additional weight. For a grueling but rewarding loop hike, head to the trailhead in Two Medicine Campground in the park’s southeastern corner. The payoff for this all-day hike is standing at Dawson Pass and Pitamakan Pass and seeing towering peaks and endless valleys in every direction. Around mile 5, keep an eye out for sheep in Bighorn Basin on your right. Two miles later, you’ll find yourself at Dawson with some of the best views in the park. Prepare for an elevation gain of more than 3,400 feet (1036 m), and dress for fierce winds, which can batter Dawson Pass during all seasons. Over the past 100 years, many of the park’s biggest glaciers have melted away. Grinnell is one of the most prominent remaining glaciers in the park and one of the easiest to reach, which makes this hike quite popular. Bring plenty of water for the glacier hiking adventure, which measures 10.3 miles for the round-trip and involves roughly 1700 feet (510 m) of elevation gain. Getting to see Grinnell up close and feel its icy cold waters will make the journey worth it. Take advantage of the open space near the glacial lake to relax and enjoy lunch. Did you know you could hike right to Canada in Glacier National Park? The often-overlooked North Fork region of the park holds one of its best overnight backpacking routes. For the first seven miles, you’ll be walking along Bowman Lake before the path rises sharply at Brown Pass near the Continental Divide and passes between three nearby peaks. After completing the 22-mile one-way hike, unwind for a couple days at Goat Haunt campground, where you can look across the lake into Canada or hike four miles to the border. Enjoy the solitude of one of the more remote sections of Glacier National Park before starting your return trip. Hikers can reach Swiftcurrent Pass from multiple directions, but perhaps the most common route begins at the Swiftcurrent Trailhead near Many Glacier Campground. Initially, the trail winds through forested areas, but eventually it becomes one of Glacier’s more scenic hiking routes. Hikers pass by Redrock Falls and several lakes before the surrounding mountains come into view as the trail rises into a series of switchbacks. Feeling ambitious? Add another mile of distance and 1000 feet (305 m) of elevation by following a steep side trail to the summit of Swiftcurrent Mountain. The views up there are even better, and no special climbing gear is needed during the summer. 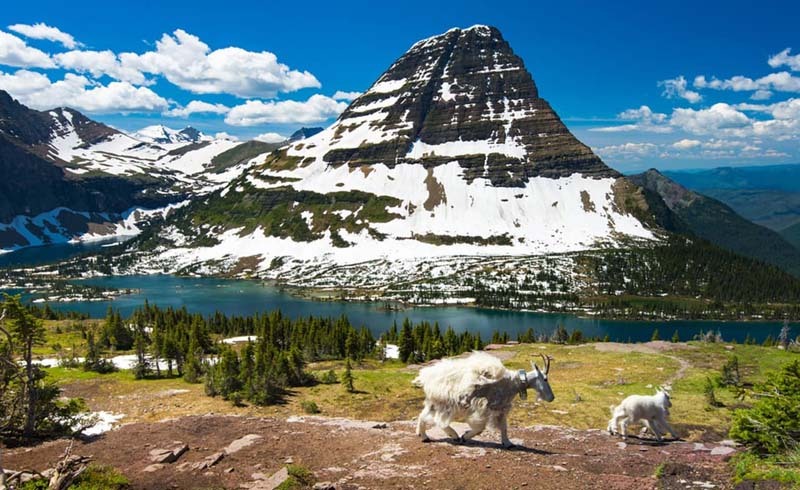 Mountain goats abound along Sperry Glacier Trail, the most challenging hike in the Lake McDonald region of the park. This trek rises almost 5,000 feet (1524 m) in elevation, making it one of the more difficult day hikes in Glacier National Park. Along the way, you’ll pass by cedar groves and waterfalls. The venerable Sperry Chalet, which served as a landmark on the trail and a popular overnight spot, was sadly destroyed by wildfire in late 2017. Plans are underway to rebuild, but in the meantime, ambitious hikers can complete the journey in one long day. Continue 2.5 miles beyond the chalet’s longtime home to reach the foot of Sperry Glacier, then turn back and retrace your steps back to the trailhead. No list of hikes in Glacier National Park would be complete without Highline, even though it is one of the park’s most crowded trails. The path begins at Logan Pass and famously hugs the mountain, giving the impression to those driving below on Going-to-the-Sun Road that hikers are balancing precariously on a small ledge. In truth, the trail is at least 4-5 feet wide in all places, and the narrow section passes quickly and opens into an alpine meadow. For wildlife seekers, the Highline provides opportunities to see grizzlies, goats, marmots, and even the occasional wolverine. The mostly-flat trail runs for 7.6 miles to Granite Park Chalet, where hikers can either turn around for a 15-mile round-trip, or continue another 4 miles downhill to the Loop Trailhead and the park shuttle bus. Would you consider taking on any of these lengthy hikes?